Most people feel since a buffet is "all that you can eat", they need all the space in their belly and by so doing they starve themselves before going for an event. This is so wrong because you will end up consuming more than you should. Always ensure you eat before heading out for any event. Before loading up your plate with food, ensure you have gone around and surveyed the entire buffet to ensure to pick the right options. 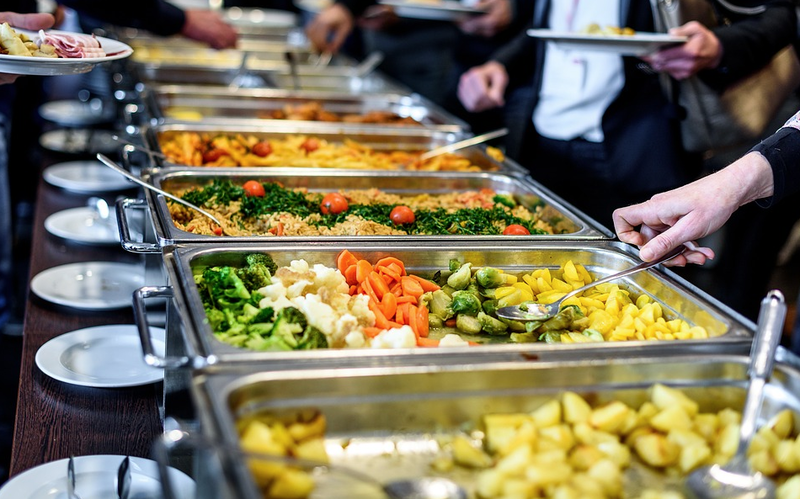 Buffet usually comprises of almost all the classes of foods and therefore gives room healthy options and with this, you can enjoy your buffet and keep your waistline in check. Vegetables are low in calories and also very filling and this makes it a healthy food choice. Fill up your plate with salad, vegetable stir-fry and at the same time be mindful of the salad dressings. No matter the class of food you are eating, moderation is always very important. Be mindful of every portion of food that goes on your plate so as to avoid calorie surplus. Eating slowly helps you get full on time. As minimal amount of food is consumed, it in turn result to a calorie deficit which eventually leads to weight loss. While enjoying your meal at the event, take your time in eating, engage in conversations with friends but remember not to talk with your mouth full😉😉😉. Fried, fatty, creamy and starchy foods. go for grilled instead of fried meat/fish, lean meat instead of pork, lemon dressing for your salads instead of salad creams and proteins instead of carbohydrates. Desserts are awesome until you realize the damage done to your waistline. When eating at buffet, go for the fruits rather than the cakes and sweets.